Huawei on Monday announced two new smartphones running Android 4.0 Ice Cream Sandwich, one of which the company claims is the "world's slimmest smartphone." "Every millimeter counts," the chairman of Huawei Device, Richard Yu, said when introducing the Ascend P1 S and the thicker Ascend P1. Yu noted that the Huawei brand already has cachet in the Japanese and Chinese markets, but this is the first "hero" or flagship product from Huawei to land in the U.S. The Ascend P1 S features a 4.3-inch Super AMOLED display with 960-by-540 resolution, dual-core 1.5 GHz Texas Instruments OMAP 4460 processor, 8-megapixel rear-facing camera with 1080p video capture, and 1.3-megapixel front-facing camera for video chat. Connectivity options include Wi-Fi, 3G and Bluetooth. The Ascend P1 S will hit store shelves around April in black, white and "cherry blossom pink." 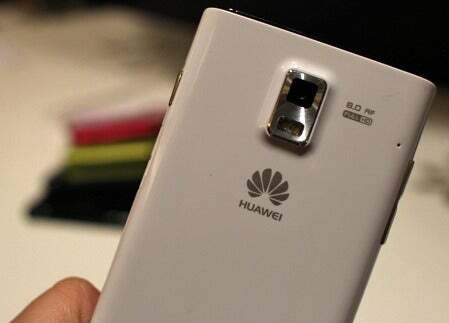 Huawei did not announce pricing or U.S. carrier availability. The Ascend P1 is very similar in specs to the Ascend P1 S but is a little bit thicker at 0.30 inches. With a depth of 0.26 inches, the Ascend P1 S beats out the Motorola's Droid Razr, the previous slimmest smartphone with a depth of nearly 0.28 inches. The Huawei Ascend P1 and P1 S feel great and lightweight in-hand. The 4.3-inch screen is lower res than on the Samsung Galaxy Nexus, but it looked sharp and had a good viewing angle. Interestingly, all buttons are hardware; there are no software navigation buttons like on the Galaxy Nexus. Melissa J. Perenson contributed to this report.